We ordered take-out fajitas the other night and had plenty of Spanish rice leftover. Eating reheated rice by itself just wasn’t jazzing my palate the other night as I was wondering what to make for dinner. After taking a quick scan of inventory, I found some promising ingredients: frozen marinated chicken breasts (Worcestershire Sauce, garlic, olive oil, and lemon juice? Can’t remember exactly – it has been cast aside in my freezer for some time. ), bag of raw baby carrots, leftover par-boiled snap green beans from a few nights before, raw onion, minced garlic, soy sauce, and some pickled ginger….see where this is going? I made a quick call to my Taiwanese-born friend Pey, my stir-fry expert. I inquired if she had ever considered using leftover Mexican take-out rice in this way. Apparently, this idea had not occurred to her in Chicago suburbia; good Mexican restaurant options are rather limited in deep dish pizza country. After a quick chop of the onions, the carrots into coins, the beans into halves, and the thawed chicken into bite-sizes, I reached for peanut oil (olive or canola is fine) and stir-fried my fears away. For anyone new to stir-frying, the general rule is to add the ingredients that take the longest to cook first, then add in the others, ending on the rice and soy sauce once everything else is cooked through. 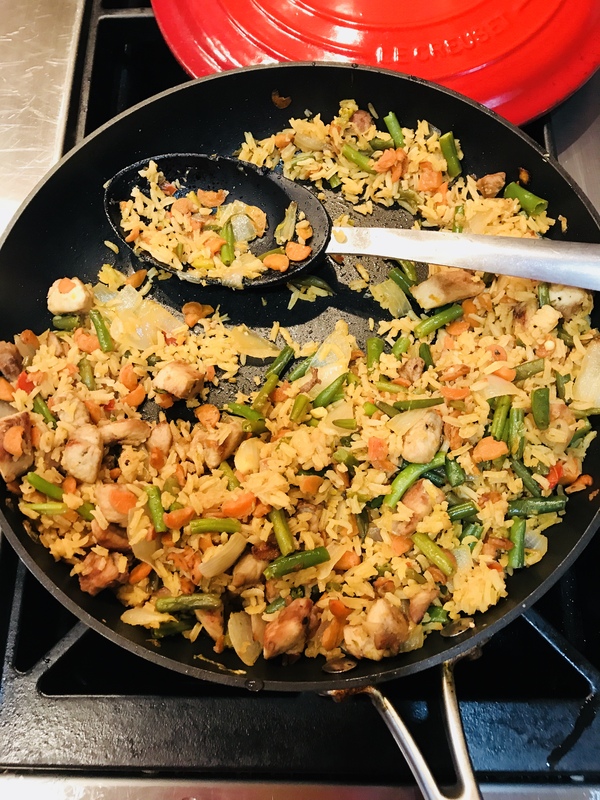 During the holidays, have fun with this versatile cooking concept and see what you can recreate with your leftover rice!